Early on this chilly Monday morning, we locked on to the conveyor belts of the brown coal power station called Loy Yang, in Traralgon, Victoria, cutting power generation to half capacity. The protest was part of a national day expressing dissent against APEC's disastrous climate policies. We have targeted coal as the worst greenhouse gas polluter. Massive conveyors taking the coal to feed Loy Yangs fires were stopped when two people attached themselves using lock on devices inside the conveyor belt room. Another conveyor belt transporting tailings was also disrupted, banners flown in full colour. Helicopters are circling above and there are many cold hands and feet, but the action has been an amazing success and we come back to the town laughing, knowing that our friends are still locked onto their machinery, blocking the movement of dirty brown coal. Our protest has transformed into creative action. Under the smokestacks we have created something that is beautiful, and we walk away with coal streaked faces, but glowing eyes. An opening- a moment of opportunity, people reclaiming their ability to create the world, people actively resisting. 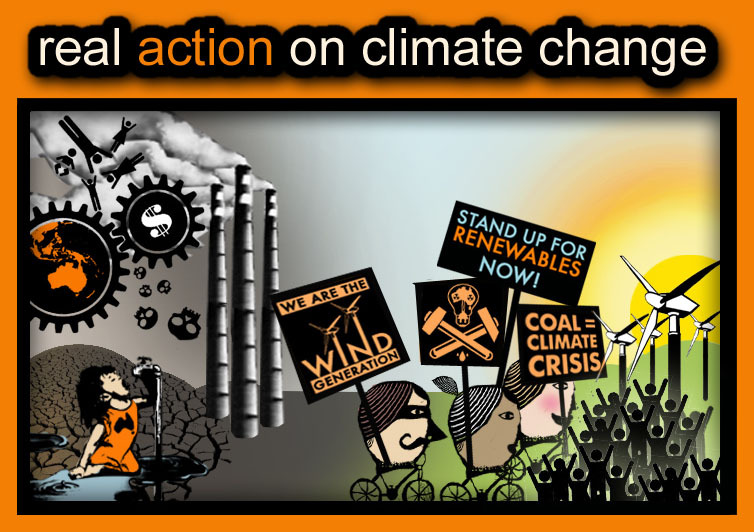 It is a beginning, we are part of a growing movement of direct action on the root causes of climate change. wow - sweet image on the blog header. amazing action - thanks - there's gotta be many more to stop the effect of burning coal on the climate! nice to give a sharp focus to climate protests at APEC - that we can't continuing "business as usual" for coal mining and coal-fired power stations if we are to avert dangerous climate change. Well done great to see the first coal power plant occupation here in Vic. Weel done all. Legends! You rocka the shoppa. Big love and respect from all us forest mob down here in Tassie. Nice work indeed. Inspiring stuff!!! Each hour you stopped that thing saved over 650 tonnes of greenhouse gases from being emitted. That's huuuuge! great action!.. Fantastic. love and solidarity from a brit that misses you all..
Fabulous and inspiring action gang. Very smart planning, and excellent location. Very brave. I expect the state and corporation will come after you because of the cost, and I trust you're set up to take advantage of any trial. This kind of interventionary nonviolence is very powerful, and the wave of the future. wow, I'm glad they did not turn the plant back on on you, that would have been nasty. did they try and do that or did you know what you were doing? how did you know where to go to get such an impact? You have no idea how risky your actions were. And now you have shown the world of nut cases that the power industry would be a good place to blow up for some political views. The people of the Valley have a different view on the power industry. Its our life and the life of all our family and friends. without this industry here there would be no comunity. I admit the coal fired power generators do pollute but until a cleaner power is produced we have to use the coal. We all contribe to the demand for coal fired power by switching on the light, going shopping, buying produce which was made with coal fired power. Yes even you Greenies. So if you want to help the envoirnment Plant trees, Fight bush fires, Develop new clean power system and sell them to the consumers, because while there is consumers there will always be power companies selling power. Get out of the city and really see what the power industry means to the people of the Valley. Ps, Your photos of the "polution" comming from Loy Yang is only water vapor from the cooling towers. brilliant! Great to see some nonviolent action in Victoria and well organised too! It is time that we started going beyond handing out leaflets and towards self-sacrifice. Self-sacrifice will hopefully create the grounds by which others will see the injustice that exists. Also totally agree with some other comments that encourage you to take the spirit of the action through the courts aswell - its more chance for dialogue and change. Its steam coming out of the cooling towers. Get your facts right.coal may not be the best, but its better than having unviable wind turbines..
You people in Melbourne are so smart,,but you don't want wind turbines in the city do you ? Hypocrits are what you are..One day we will be rid of coal generators but no way do we want nuclear. If you are fair dinkum,,conserve your electricity, Turn your Mobiles off..they use electricity when being recharged,the telephone towers use electricity,,,your dunny needs electricity,,,everything you touch requires electricity..
you city people are so off the mark..You waste that much electricity yet condemn the generators of electricity,IF you wankers did not waste electricity, it would not need to be generated..
Relying on Emergency stops for protection is stupidity...E Stops cannot be relied on,,even we do not trust them..they can get moisture in them and stay activated ,even when they appear tripped. GET a LIFE,, and conserve electricity,,,turn off the gas heating and electric heating and cooling. Hey Windy Hill - I think you're really cool, let's conserve electricity together. And 'the generator' - i'm developing some clean energy technology like you recommend - wanna buy some? It's not always true that city people are wasting electricity - no wastage at my place. We don't use power for heating and cooling where i'm from. We live in little houses stacked next to and top of each other. Like a bunch of eskies, we're all insulating each other - . I'm on 5kWh/day in a house of 4 people but I'm aiming to cut that down to 1.5kWh/day with solar hot water. What are you on? You can check out tips for saving energy here - energycoop.com.au. We're giving a free solar system to the person that conserves the most electricity. DOZENS of power plants nationwide are being urged to review security after "ratbag" APEC protesters today broke into and locked down Victoria's biggest station. Environmentalists are believed to have cut a hole in a wire fence at the LaTrobe Valley's Loy Yang plant before chaining themselves to equipment and disrupting production for several hours. The breach - described as a "wake up call" by the industry - cost company Loy Yang Power $200,000 and has raised fears about potential terrorist access to key infrastructure. Police Minister Bob Cameron blasted the protesters, saying they were ratbags who had threatened the state's electricity supplies. Four of the 12 protesters accused of storming the station under the cover of darkness at 5am to make a statement on climate change were charged with trespass. The charged intruders are accused of locking themselves to a conveyor belt carrying coal to a power generator, sparking a shutdown. They were bailed to appear in court later this month and face penalties of up to $2500 or six months' jail.